Having just returned from the 100th Anniversary meeting of the Western Society of Naturalists meeting in Monterey, it seems like a fine time to generate some new summary data of trends in live-tweeting meetings. I originally addressed this some time last year in this original post: https://lukemiller.org/index.php/2016/01/is-live-tweeting-meetings-losing-steam-scicomm/. Since that time, there’s been new iterations of the WSN meeting and the Ecological Society of America meeting. I’ve scraped the Twitter archives for the relevant meeting hashtags (#wsn100 and #esa2016), and removed all retweets, so that only ‘original’ tweets are tallied here. Shown first below are the meeting totals for the Western Society of Naturalists, followed next by a boxplot showing the distribution of per capita tweets, with a few of the highest outliers labeled with their Twitter user names. WSN 2016 was the largest version of the meeting ever, with 934 attendees, while recent years have had attendances between 600 and 750. The exceptionally large attendance this year is reflected in the larger total number of tweets, which came from a larger pool of tweeters (124 users, up from 80 and 90 in 2014 and 2015). The average per capita tweet rate was lower in 2016 than any prior year (0.133, vs. 0.18-0.36 in 2012 to 2015), although in the boxplot above you can clearly see that some folks were busier than ever. The Ecological Society of America meeting happened in August of 2016, but I didn’t go and thus haven’t bothered to look at the data until now. Once I finally scraped the data for the meeting, things got a little weird, and I’ve had to do some extra parsing of the results, as shown below. After a big year in 2015, which happened to be the 100th anniversary of the ESA society, the tweet totals dropped off in 2016. Looking at the distribution of per-person tweet counts, 2016 has one humongous outlier [@meeting_goer] that was far and away above everyone else, racking up nearly 1000 tweets during the 6 days of the meeting. I went back to Twitter and manually checked the account’s posts to make sure they were actually posting about the ESA meeting. 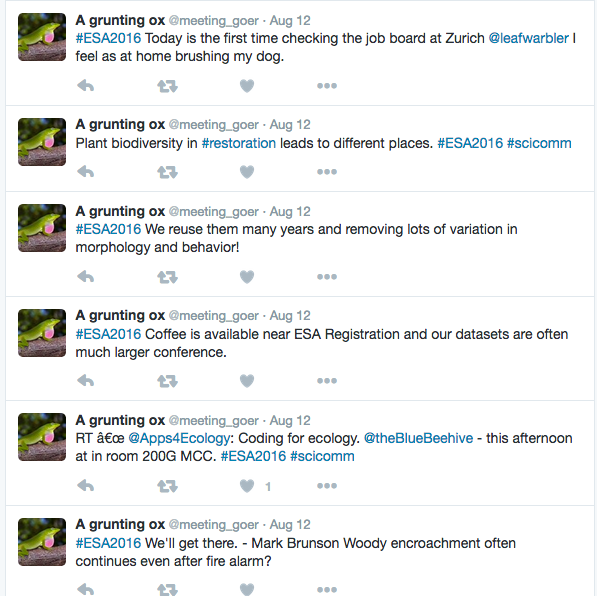 It turns out that meeting_goer was definitely posting about ESA, and even using a #scicomm hashtag, but after reading the tweets for a while, it quickly becomes obvious that meeting_goer is the output of some kind of Markov bot. A sampling of the weirdness. Twitter is full of Markov bots (see https://twitter.com/DeepDrumpf for another example), and someone apparently set one up for the ESA meeting and let it run wild. Given that the most prolific tweeter of the meeting seems to not be real, I re-made the figures with @meeting_goer separated out. Removing the one outlier brings the per capita tweet totals closer in line with previous years. The average per capita tweet rate during the meeting was 0.14, which is right in line with the previous 3 years (0.14 to 0.15). The number of unique users in 2016 was 676, down from 950 at the ESA 100th anniversary meeting. The Society for Integrative and Comparative Biology meeting took place January 3-8 in New Orleans, LA. The Twitter trend for SICB is seemingly on the downslope for the 2nd year in a row, from the peak in 2015. There was no wifi provided for the meeting venue this year, but the cell phone data coverage was quite good everywhere in the convention center (at least on Verizon’s network). Maybe people are less apt to post to Twitter using their cell data, but I’m also willing to bet that people are just losing steam for reading the same old repetitive low-information tweets about talks they missed. The posting crown this year goes to Adam Summers [@Fishguy_FHL], in part due to the apparent absence of several prolific users from previous years. Scraping of the current data was done in R using the twitteR package written by Jeff Gentry. If you’d like to see the csv files containing all of the tweets for a particular meeting, contact me directly.